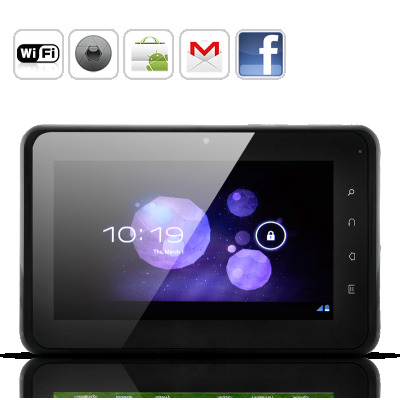 Successfully Added Android 4.0 Tablet PC "Marvel" - 7 Inch Capacitive Multitouch Screen, 8GB, Wifi to your Shopping Cart. New Marvel Android 4.0 ICS Tablet with 7 inch Capacitive Screen, WiFi, and massive 8GB internal memory to bring you a whole new tablet PC experience. Armed with China’s world class chip producer, Vimicro’s 1GHz 882, A8 processor, and armored with an ultra-responsive capacitive screen, the Marvel Tablet responds immediately to your every command. Now with the latest Android 4.0 ICS, playing with the Mavel Tablet is even more a delightful experience. Refined and evolved UI, resizable Widgets, redesigned Gallery apps, improved web browsing... there are tons of new features and enhancements with Android 4.0 waiting for you to explore. With hardware and software that perform, this is one tablet that you should not miss out on. It’s the details that make the Marvel tablet experience different. Unlike other tablets, the Marvel is slightly curved on the two ends, enabling it to rest your two palms snugly and comfortably. Just imagine yourself sitting in cab sending an important email to your client, and suddenly the driver hit the brake so hard that you almost fell to the floor - but your Marvel will still sit in your hands, intact. If you have already spent hundreds of precious dollars on a smartphone, than we would strongly recommend you buy this high quality OEM tablet. It’s hundreds of dollars cheaper, yet it rivals any other name brands on the market. When all tablets run on the same Android OS system, the hardware says it all. And this baby has it all. So hit the add to cart button now, whether you are buying one for yourself or buy for resale, the Marvel Android 4.0 ICS Tablet is guaranteed to be a hit. It also comes with a 12 month product warranty. From the leader in wholesale Android tablets and smartphones, Chinavasion. I ordered 2 of these so the kids could have something to do in the car on long trips, instead of just watching dvd's. And I have to say that CV have really excelled themselves with this unit, they have both functioned flawlessly for 6 months now and I am glad I bought them. The only thing that could make them better would be either a car charger for them or, a change in design away from the current charge port to a generic mini usb.